Our Temprakon-Advance down duvet is thought by many to be the best duvets on the market. After just one night asleep under its fluffy “Premium Class-1" down filling you won’t ever want to try another. 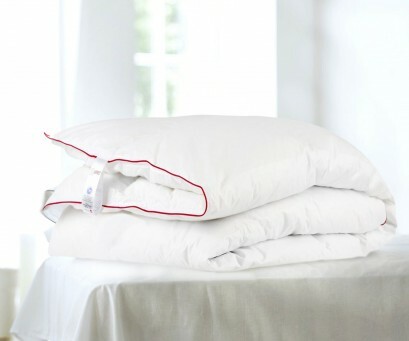 The Temprakon-Advance down duvet is light, wrap-around, soft and super comfy. Its superb “Premium Class-1" down filling is considered in Europe to be of the highest quality. It doesn’t become lumpy and after a long period of constant use looks the same as the first day you bought it. The outside cover of this luxury down duvet is made of 100% Super-Cambric cotton wonderfully soft to the touch, long-lasting and resistant, whilst its specially designed manufacture means there is no loss of down from the inside of the duvet whatsoever. But not only is this down duvet an excellent duvet with the very best of fillings, it is also able to regulate the temperature of your bed whilst you are asleep. The secret for this lies in the thermo-regulating fabric which has been used. Say goodbye to cold and excess heat, and experience instead unbelievable comfort! Duvet Positioning Place the duvet active side (the thermos-regulating surface) facing the body. Identify this side by the label on one the duvet corners. Duvet cover Duvet cover is recommended for protection. A breathing fabric such as cotton, silk or tencel is recommended. We know how important the filling of a down duvet is, and unlike the majority of manufacturers we inform our customers very clearly about the quality and where the down we use has come from. Our “Premium Class-1” down is the very highest quality down in Europe! 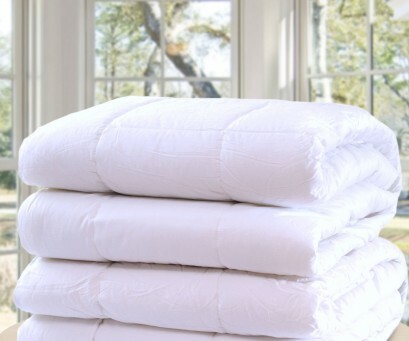 Lightness, warmth and amazing fluffy softness - all in one very special down duvet treat! The superb down filling used in this fabulous duvet has been given, by the European Down-Feather association (EDFA), a “Premium Class-1” certification– the highest quality certifications offered in the world of down filling. Our manufacturers have also selected their suppliers with the utmost care so to obtain for you this excellent down quality. We always use down originating from Europe. To make sure that a Temprakon-Advance down duvet has perfect body and is really comfortable we mix 90% of ‘Premium Class-1’ down with 10% of the tiniest feathers. You will feel the softest and gentlest feeling of soft high quality down around you and enjoy the optimum in comfort. Treat yourself!!! A Natural outside cover wrapped around a cloud of down! The outer cover which encases the down filling is made of 100% Super-Cambric cotton, totally hypo-allergenic and with a soft and natural feel. Thanks to the tightness of the weave of the fabric we have managed to obtain a fabric which is both resistant and long-lasting. It is impossible for down to escape from inside the cover of this luxury “Premiun Class-1" down duvet! The outside cover of this super special down duvet offers a sensation of natural freshness making you completely comfortable. 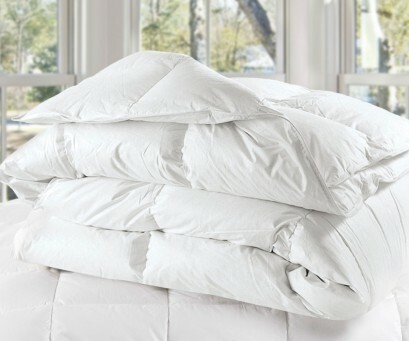 Thanks to a special treatment with natural plant oils, this duvet will stay fresh and natural day after day. This Temprakon-Advance down duvet is divided into cassettes or sections all with double-stitched inside seams and thermo-sealed, and with each cassette containing the same carefully calculated and balanced amount of down. In this way the filling is dispersed uniformly throughout the duvet ensuring uniform thickness and warmth at all times. A soft and fluffy superb down duvet which is also ‘intelligent’! And indeed, it is very intelligent! This fabulous down duvet is able to adjust the temperature inside the bed whilst you sleep in such a way that you enjoy an unbelievably sound night’s sleep. 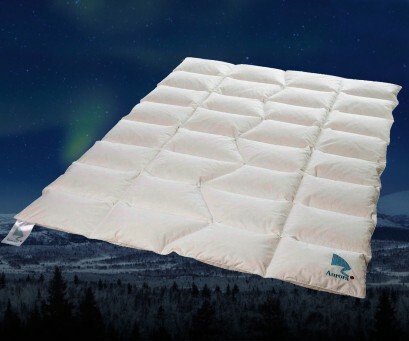 One of the inside undersurfaces of this down duvet has, incorporated into it a thermo-regulating fabric, which is imperceptible to the touch and originally developed by NASA to regulate the temperature of astronauts when outside the earth’s atmosphere. This fabric has the ability to collect the heat produced by the body and store it in this luxury down duvet. Then if temperatures drop the stored heat is released, so maintaining the ideal temperature inside the bed whilst you sleep. This Temprakon-Advance down duvet is also able to dissipate excess moisture so that you sleep soundly without feeling too cold or too hot and without sweating. Find out more about Temprakon-Advance. This fabulous down duvet is capable of regulating independently the ideal temperature for each of two people sleeping in the same bed. This is the perfect solution not only for for two people whose body temperatures are different and who require tailor-made and individual attention, but it´s ideal for single beds too. Thanks to its amazing thermo-regulating capacity, you can enjoy this truly remarkable duvet for far longer periods of the year. All through the different seasons this duvet automaticaly adapts to changing temperatures, meaning that whether it be Summer, Winter, Spring or Autumn you can benefit from perfectly regulated temperatures whilst you sleep. You need just one duvet for almost all the seasonal temperature changes during the year! In colder regions you can enjoy the Winter duvet ( Warmth Rate 3 ) all through Winter, Spring, Autumn and most of the Summer. In warmer areas, the Spring duvet ( Warmth Rate 2 ) will be the one to suit your needs almost all through Winter, Spring, Autumn and Summer. Without any doubt, our duvets are an excellent investment in your year-long well-being and comfort. Don't hesitate! Buy now and experience these exceptional duvets for yourself! Why is it you immediately fall in love with the Temprakon-Advance down Duvet? The answer is easy! It’s simply because it is a very special duvet indeed. Its success is not only due to its “Premium Class-1" down filling or its cotton hypo-allergenic natural cover, or because of its temperature regulating capacity. The Temprakon-Advance down duvet is immensely successful too because of its design, and because the outer shell and the down used has been specially treated so that even if you have sensitive skin, dermatitis or asthma you can happily use it. 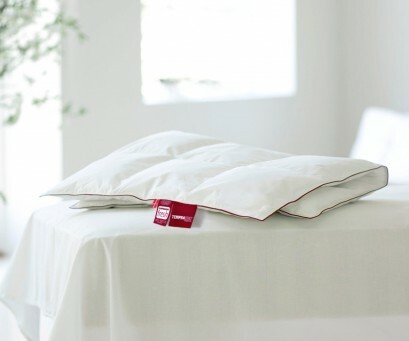 This down duvet carries with it a two-year manufacturer guarantee and each duvet complies with the high quality standards demanded by: OEKO-TEX, ASTMA & ALLERGI DANMARK, NOMITE, DOWNAFRESH/DAUNASAN, EUROPEAN DOWN & FEATHER ASSOCIATION and CERTIFIED SPACE TECHNOLOGY. An unbelievable example of long-lasting quality, luxury and comfort which is an exceptionally worthwhile investment for you, your family and your friends. And don’t forget that we allow you to change the product or get your money back if you are not entirely satisfied with your purchase. All I can say is that I am absolutely delighted with the Temprakon Advance duvets I bought from you. The Temprakon technology does indeed deliver what it says: "a dry and fresh sleeping environment that creates optimal conditions for a good night's sleep." Duvetopia also provided exceptional customer service including fast delivery of orders.Kudos to you and everyone at Duvetopia. Se non fossimo venuti a sapere di Temprakon, mia moglie ed io non avremmo mai preso in considerazione l'ipotesi di dormire sotto un piumino perché è ancora vivo il ricordo delle poche volte che ci abbiamo provato, in anni lontani, nel corso di vacanze in Austria e in Alto Adige: il ricordo, cioè, di notti agitate, trascorse a cercare un impossibile (almeno per noi) bilanciamento termico fra il troppo caldo "sotto" e il troppo freddo "fuori". Col piumino Temprakon Advance che abbiamo acquistato il mese scorso tutto questo resta soltanto un ricordo. Leggero, avvolgente, capace di conservare la corretta temperatura del corpo durante le varie fasi del sonno, questo piumino è davvero fantastico. In questi mesi invernali, la temperatura della nostra stanza da letto varia tra i 17 e i 18 gradi centigradi e la scelta del modello per la mezza stagione (7 Tog to 10,5 Tog) si è rivelata indovinatissima. Valuteremo più avanti se completare la dotazione con l’acquisto del modello estivo. Due parole infine su Duvetopia, che per noi è stata una piacevolissima scoperta dopo avere invano ricercato in Italia rivenditori di prodotti Temprakon: sito facilmente navigabile e ricco di utili informazioni, gamma prodotti completa per quanto riguarda sia le proprietà di isolamento termico del piumino che le sue misure dimensionali, procedura d’acquisto semplice e intuitiva, fatturazione immediata, spedizione rapida e a prezzi ragionevoli, eccellente comunicazione. Esperienza d’acquisto assolutamente positiva! Consigliatissimo! Yes, we are very happy with our duvet, pillows and topper, thank you, and they have been really warm and cosy especially on the slightly colder nights. We are extremely satisfied and they are all we hoped they would be. Duvets arrived at 9.15 this morning!! Thank you for your cover letter - your service to date has been excellent! Also your information leaflet has answered all the questions that were going around in my head. The owners of the duvets are me, my daughter and my sister and I have no doubt they will be passing on this new sleeping experience to their friends and families. It was my brother who introduced me to Temprakon. We like the windows open all through the year, and with this new feather duvet we are certainly never cold. When we stayed in Kent with friends a light duvet was enough. But here in Glasgow! We took your advice, and are very happy with the heavy one you suggested. Indeed it´s great duvet.This duvet seems to know when to turn the temperature up and down – and we both sleep so well. The spring duvet seemed too light at first, but little by little we got used to it, and the truth is it keeps us really warm and relaxed all summer nights. Whilst we were away our son tried it and thought it was great - so we treated him. He says it’s really cool! My partner and me bought it between us. We love it and we are both really happy. Finally we sleep really well! All those good comments are right. It’s great! It was recommended to us. And I can happily recommend it to others – especially now that the nights are so cold. Yummy! Thanks for this wonderful duvet! We wanted to buy our two teenage boys something useful for Christmas. Useful? They love them and don’t want to get up! We don’t have to worry, the boys wrap themselves up in them to watch TV, do their homework in them, and they want to take them on holiday. It has been a great present! A good buy for any two youngsters. The heating is not necessary now at night – this duvet is more than enough. It’s not cheap, but in the end you save money. We are Absolutely delighted with this down duvet. Thanks a lot for your good service. We don’t like being cold and we were going to buy the heavier duvet, but I´m glad we didn’t. My wife and I are not too hot and not too cold – we don’t complain in bed nowadays! We quickly got used to the lighter weight of the duvet – and now we wake up fresher and more rested in the morning. A good choice for warmer days. It´s a great present! And it is SO good! Couldn’t be better! Might well get another for the kids – if they behave! I know they are expensive, but it’s worth it! Like lots of couples one is hot at night - and the other is cold! After lots of investigation, asking around and reading about all the different duvets available nowadays, we were finally convinced and plumped for this one. The thermo-regulating properties we read about so much really do seem to work. How I don’t know! But now he sleeps on one side of the bed and is happy – and I am happy and warm on my side too. Perfect! He insists on having the window open in the winter here in Cumbria! But now I don’t care and he can do what he likes! I am really lost to the world under this fantastic duvet and so happy when he gets up and lets me lie in! Dear DUVETOPIA, thanks for this grat service. We kept it for a week, were still cold at night and you changed it for the heavier one. We appreciate that. Now we are over 70 my husband and I feel the cold much more than before. It’s worth the money. A friend told us they were good. And they are. I think it´s expensive but good value. Although a bit dear we don’t regret buying this Temprakon duvet. Obviously so much better than the one we had. You can’t compare it for quality! It was a good buy. My husband wants to stay in bed longer now! And my early cup of tea? What happened? Really comfortable nights. A good duvet. Don’t hesitate! I will get another one for my kid! Now we are really warm at night! Hooray! really worth it! Things are getting better all the time, and this is certainly an incredible improvement on our old duvet. Out of this world! This down duvet is really well made and I can see it will last us our lifetime. It looks really good on the bed, and inside the bed you can really snuggle down and have a good night.The service was brilliant and I would definitely recommend DUVETOPIA. I am Completely satisfied. When the temperature goes down in the early morning the duvet seems to get even softer, warmer and snugger. Not easy to get up! It really adapts to a wide range of temperatures and I never feel hot or cold. My bedroom faces north and can be really chilly at night. But I never complain now and never wake up in the middle of the night as I did before. It was quite expensive but worth it! It´s great and excellent! We are both in love with it! Getting the right weight is the tricky thing. Here where we live it’s really cold from December to March, but with this new duvet we don’t notice the cold at night any more. It works really well.